Researchers will go to Michigan's Upper Peninsula next month in search of evidence that the hairy manlike creature known as "Bigfoot" or "Sasquatch" exists. The expedition will center in eastern Marquette County, following the most recent Bigfoot eyewitness account, said Matthew Moneymaker of the Bigfoot Field Researchers Organization. "We'll be looking for evidence supporting a presence. ... We hope to meet local people who might have seen a Sasquatch or heard of someone else who had an encounter," Moneymaker told the Daily Press of Escanaba. Outlandish theories about the origin of Bigfoot abound, including that it might be an extraterrestrial. Many believe that a towering, ape-like creature descended from a prehistoric 10-foot-tall 10 (3-meter-tall) gorilla called a Gigantopithecus, and that it now inhabits North American forests. Hoaxes have been a large part of the making of the Bigfoot legend. California construction company owner Ray L. Wallace donned 16-inch (40-centimeter) wooden feet to create tracks in mud in 1958, and it led to a front-page story in a local paper that coined the term "Bigfoot." 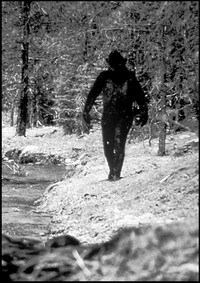 But there have been more than 2,550 seemingly credible Bigfoot sightings reported in North America the past century, according to Christopher L. Murphy's 2004 book "Meet the Sasquatch." Murphy believes thousands more witnesses are too afraid of ridicule to come forward. Michigan's Marquette County has logged the most reported Bigfoot sightings with four, Moneymaker said.